TheJournal.ie’s roundup of what’s on the box today (even if you’re feeling more Bah! Humbug! than Ho!Ho!Ho! FROM JUSTIN BIEBER to Donny Osmond and James Bond to Santa Claus, there really is something for everyone (and every mood) on television over the next three days. We’ve trawled through the television guides for you so break open the tin of Roses (or Quality Street), sit back and enjoy some of the best programmes and films the small screen has to offer today. -Indulge in the wonderfully stupid comedic genius of Rowan Atkinson. -Christmas would not be Christmas without Ted, Dougal and Jack and their ridiculous antics. -If you have never witnessed the Brockmans in action, today is the perfect time for the best laugh you’ll get all year. The sitcom features three of the best child actors in Britain in Tyger Drew-Honey, Daniel Roche and Ramona Marquez who all semi-improvise their way through the script. -The show’s title says it all. -Start the day with a wholesome dose of John-Boy and Mary Ellen. -The programme unveils festive moments from the BBC archives highlighting the changing face of Christmas in Northern Ireland. Among the celluloid stocking fillers are toys, tinsel and visits to Santa Claus. -The BBC journalist look back at some key moments during his 40 years on Newsround and Countryfile. -The BBC once more delves into its archives for some wonderful moments from the comedic pair. -The one-time teen idol looks back at his career. -An hour-long look at the story of Christmas. -With emigration hitting such high levels and Dublin Airport expecting more than 620,000 passengers to come through its doors this week, there’s sure to be a few tears shed in the arrivals hall today. -In another tear-jerker, Martin King meets some of Ireland’s bravest children. -Join ever-present hosts Ant & Dec and Holly Willoughby as they raise money and awareness for those in more vulnerable positions this Christmas. Plenty of special guests in what looks set to be an entertaining, festive telethon. -Live Christmas Eve service from Rathmines, Dublin. -The Royal Opera ends its season with a revival of Puccini’s score. -An early Christmas present for many as Daniel O’Donnell performs with the RTE Concert Orchestra. -An alternative to Daniel and a must-watch if you are a girl under the age of 18. The indestructible teen idol takes to the stage to delight his Beliebers with such hits as “Baby” and “Mistletoe”. -A look at the career of the traditional Irish group, including its performances for two US Presidents. -The Canadian crooner usually works overtime in December but this year he’s brought his work home to his luxury chalet. -The 1985 film starring Dudley Moore as Patch the Elf and John Lithgow as the evil toy maker B.Z. is a must-see over the holiday period no matter what your age. -Arguably the best film of the series (helped mightily by the presence of Brenda Fricker), young Kevin finds himself on his own (again) but this time he has to navigate the mean streets of Manhattan. -The 1970 musical with Albert Finney as Ebenezer. -Although it’s not strictly a Christmas movie, it usually is broken out during the holiday season. -Megan Fox and Shia LaBeouf work to save the plant from evil robot The Fallen. Not very Christmas-y then. -Daniel Craig as James Bond should keep the festive spirit at bay if that’s what you’re after. -A late night battle between Spartacus and Crixus. For those with subscriptions to digital services, other programmes and movies will be available throughout the day but for the purpose of this roundup we stuck to cable channels but feel free to discuss any other favourites in the comments section. Email “What's on? Christmas TV for every mood ”. Feedback on “What's on? 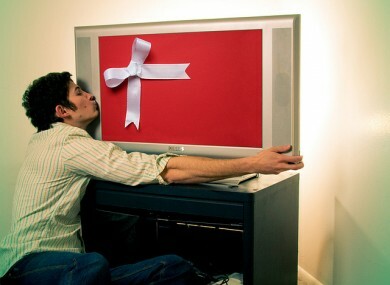 Christmas TV for every mood ”.